Obama's "Strong Cities" Initiative Is Global In Scale, Dedicated to Countering "Violent Extremism"
More than 200 representatives from 50 global cities met in Antalya, Turkey last week for the premiere Strong Cities Network Global Summit to explore the role of municipalities in countering violent extremism. The Strong Cities Network (SCN), run by the London-based Institute for Strategic Dialogue (ISD), brought together key stakeholders for two days of training and capacity-building sessions, fostering collaboration and sharing valuable lessons and practice from around the world. Cities and local authorities around the world need to be at the forefront of preventative and safeguarding measures to counter violent extremism in all its forms. Now more than ever, mayors, governors, frontline practitioners and local communities must play a key role in building social cohesion and resilience, promoting inclusion, and mitigating vulnerability to extremism and radicalisation. This is the rationale behind the unprecedented efforts of the SCN – with a goal of connecting local partners on a global scale. Why is the FBI suddenly bringing up Terry Nichols and OKC as examples of the sovereign citizen movement? It goes along with their right wing extremist as the biggest terror threat narrative but it’s odd. I also hate the way they called the beards Duck Dynasty beards. I’ve never heard them refer to a Muslim’s beard as an Osama Bin Laden beard. Perhaps just passing through for military transport through Andrews AFB or some other military location ...or not? The United States provided ten armored vehicles to the United Nations to support UN and OPCW efforts to verify and destroy Syria’s chemical weapons. 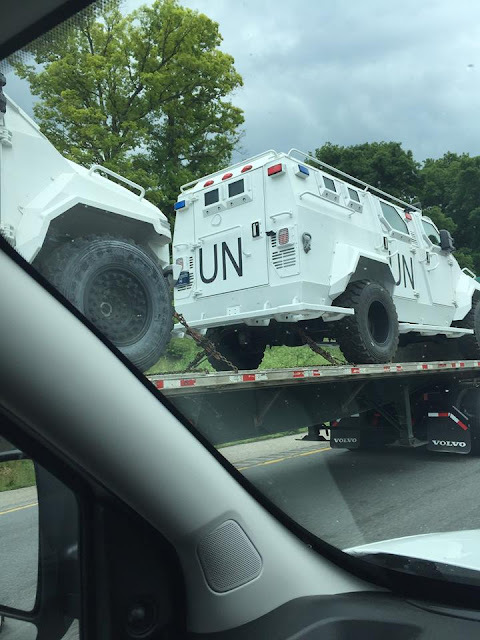 The Department of State’s Nonproliferation and Disarmament Fund paid $1.55 million for the ten armored civilian vehicles and coordinated with the Canadian Armed Forces (CAF) to arrange their transportation and delivery to the UN. To further support this effort, the United States arranged for the use of Joint Base Andrews (JBA) as a launching point from Maryland to Lebanon, while Canada contributed the use of a Royal Canadian Air Force (RCAF) CC-177 Globemaster III aircraft from 8 Wing Trenton, Ontario, to airlift the vehicles to the Middle East. The vehicles were flown on two separate flights starting Thursday, October 17, and concluding Sunday, October 20 when they were accepted by the UN. BBC Dec. 2014: BAE wins $1.2bn US combat vehicles contract The vehicles are built at the BAE Systems plant in York, PA. From there they carried down I-81 to I-77, and then I-95 towards the port of Savannah to be shipped overseas. I guess that's why they were on the highway in Virginia. This is way bigger Pasto. Thank you, Mayor [Bill] de Blasio, for those kind words; for your dedication to promoting equality and expanding opportunity; and for your service to the people of this great city – the city I call home. I would also like to recognize High Commissioner for Human Rights [Prince Zeid Ra’ad] Al Hussein and the UN-Habitat program for their inspiring work and bold leadership as we work to create a future of sustainable peace, development and opportunity. Hmmm.....WHO is Prince Zeid Ra’ad Al Hussein? WSJ: Why does the IRS need guns?